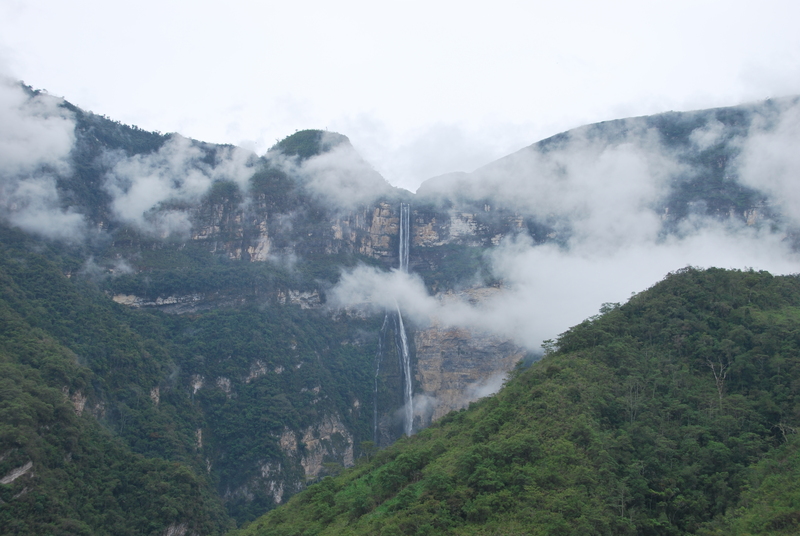 Chachapoyas: As fun to say as it is to visit! Reading about Chachapoyas, or Chacha to the locals, gave us hope that it would be similar to Jardin, our favorite little town in Colombia. 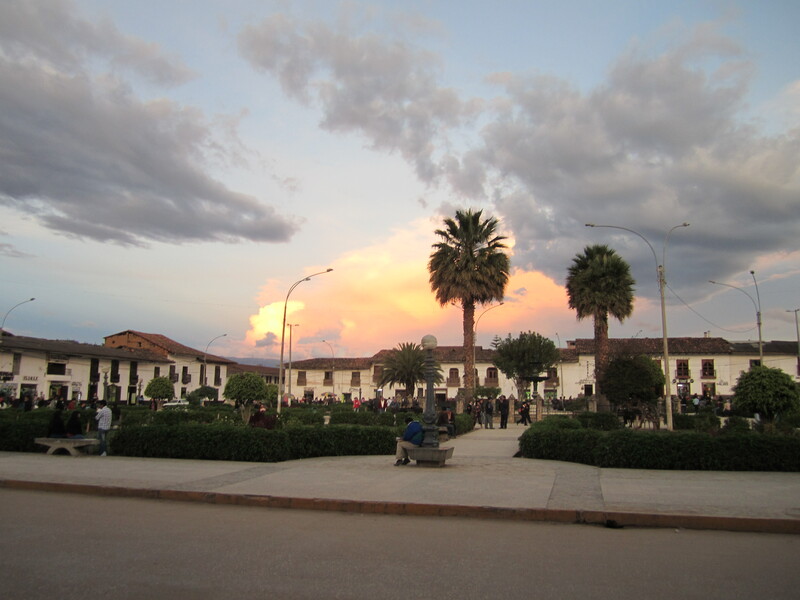 It was described as a quiet town with central square where everyone would hang out. We love just sitting in these squares and watching the world go by. And trust me, after our crazy three-day adventure just to get there, we were ready to spend some time relaxing in the square just people watching. Chacha was a very enjoyable town to spend some time in. In addition to the large and beautiful square, there was also a nice pedestrian only street that was great for a stroll (and not just because you didn’t have to worry about getting run over). The city was full of friendly locals and there were helpful vendors selling Joe’s new favorite treat, popcorn. While it did not have small cafes lining the square like in Jardin, it definitely had a great atmosphere that should not be missed. Chacha is also not lacking in tour operators, as there seemed to be at least one operator for every tourist (we were assured that there are usually many more tourists, but we visited during low season). There were so many different day trips that you could literally do a different trip every day for two weeks. 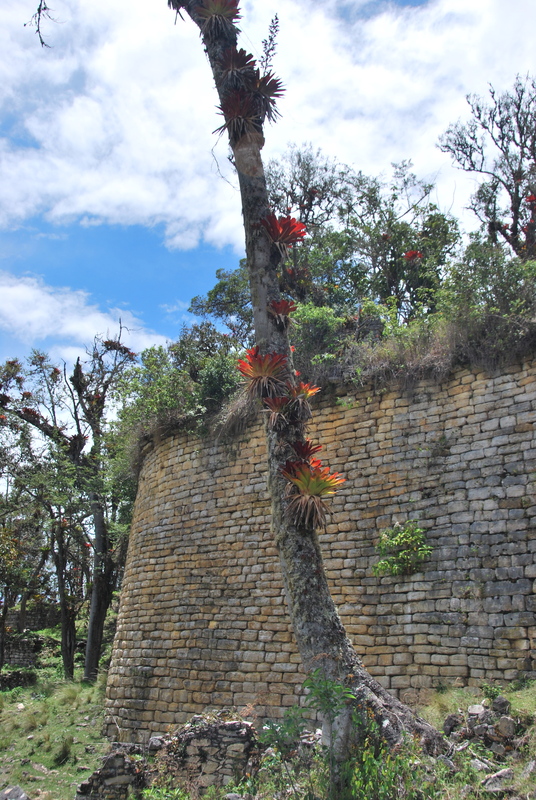 While we spent one day exploring the town’s sights on our own, we decided to use tours to see two different highlights: the Kuelap ruins and the Gocta waterfall. On our first full day in Chacha, we wandered the town before we took a taxi to Mirador Huancas. We were greeted by amazing views on the ride, and even better views upon arrival. We were the only people there and felt lucky to be able to sit back and soak it all in by ourselves. 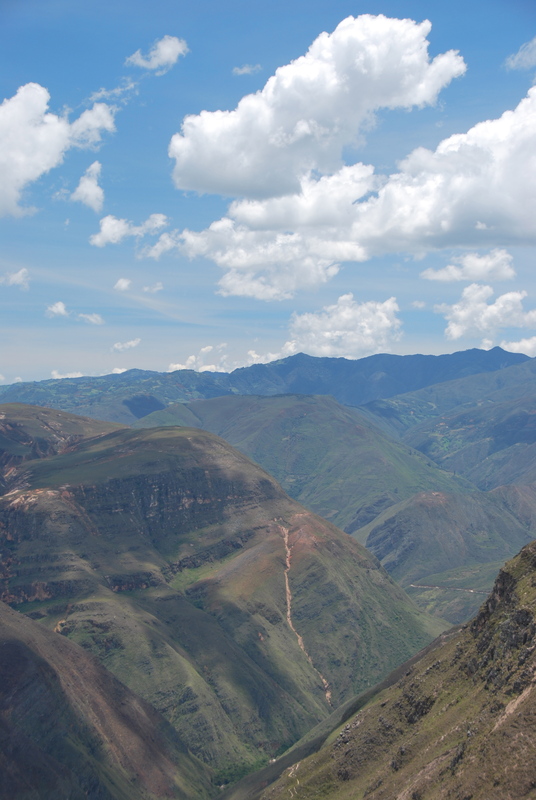 Mountains are quite numerous in Peru. While it was not as grand as the Grand Canyon, it was still one of the better lookouts around. We walked back to town from the mirador (1.5 hours) just steps ahead of the rainstorm that was fast approaching. We luckily only got rained on for a few brief minutes. 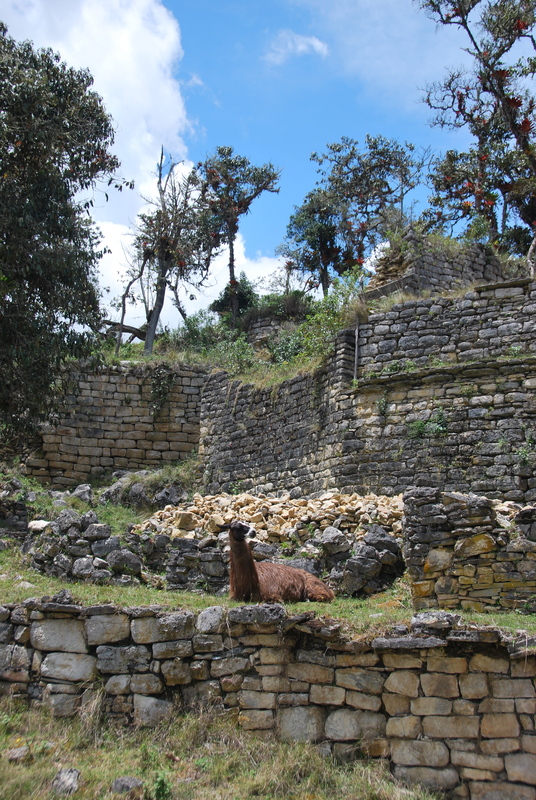 The next day, we left the city of Chachapoyas and took off on a three-hour ride up and over mountains to discover the ruins of Kuelap. Peru does not seem to lack in interesting car rides. It seems every time that we drive anywhere, the road seem to disappear in to a 1,000 foot drop off and there are hair pin turns every few hundred yards. This is the view of the road to Kuelap from the ruins. Insane. While driving to Kuelap, we were able to see the ruins in the distance for about two hours, but going around the massive mountains and deep ravines made the trip extra long. If only there was a zipline! Kuelap was built about 1,500 years ago and is described as a fortress, although there is some debate about the purpose of the structure. 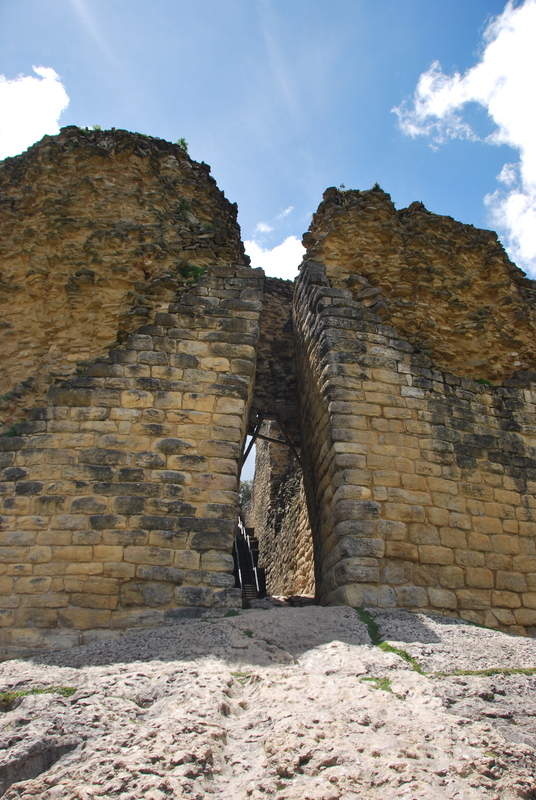 With its massive rock walls and narrow entrances, it seems that it was built by the Chachapoyans to protect themselves. These ruins are considered second only to Machu Picchu, but we really enjoyed them because there were so few tourists there. We have heard that Machu Picchu will see up to 4,000 tourists per day, but I bet we didn’t run into more than 20 at Kuelap, and that includes our group of nine. The site was felt very authentic with the addition of a few “wild” llamas. Joe thinks they were moved in to keep the grass short. All the walls were made from hand cut stone, which according to our guide, could be found as far as three miles away. This made the job of the guy collecting stones tough, especially because this site is 10,000 feet above the sea. This site has remained relatively untouched, except for the one structure with the roof which has been rebuilt to show people what the buildings looked like during their heyday. 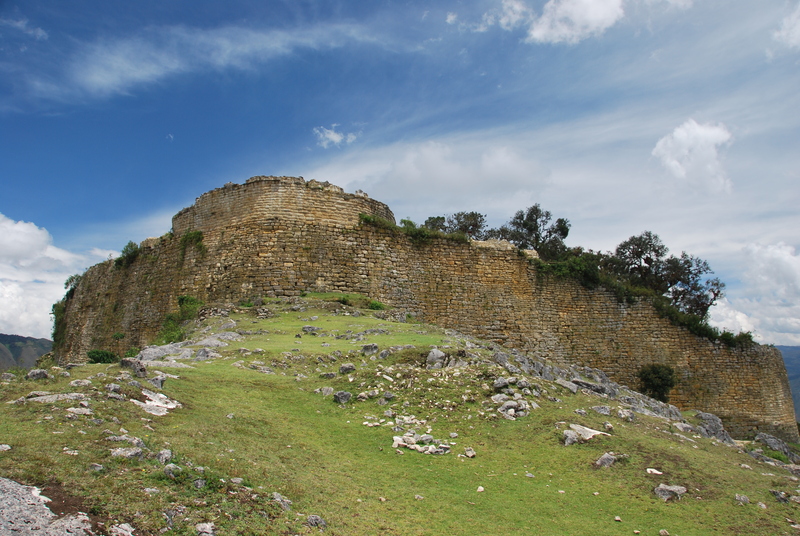 The Chachapoyans built their buildings in circles for more stability, while the Incas built with right angles. 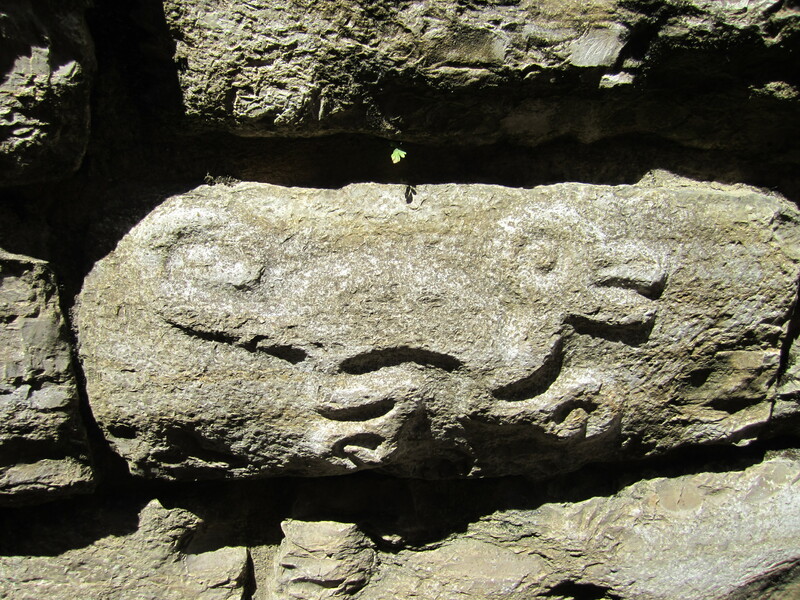 There were many stones with different animals and/or faces depicted. It was really incredible to see that all the stones fit so well together and have stood the test of time, especially when you consider that all this was done without the use of modern tools. One of the most impressive structures- How did they do that? This fortress has only three entrances and all were very narrow and steep. You could easily see how they should have been able to defend this area with relative ease. Overall, we were really impressed by our first Peruvian ruins! We’ll have to see how Machu Picchu stacks up. 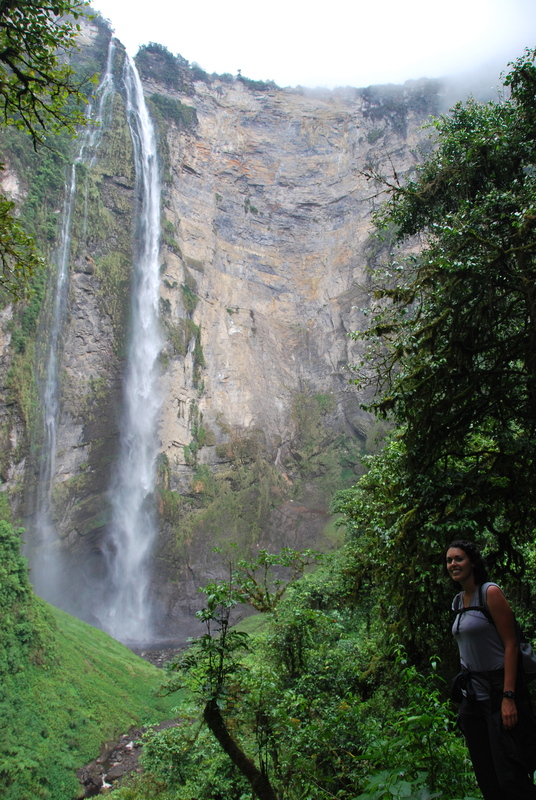 On our last full day in Chachapoyas, we took a trip to the Gocta waterfall. 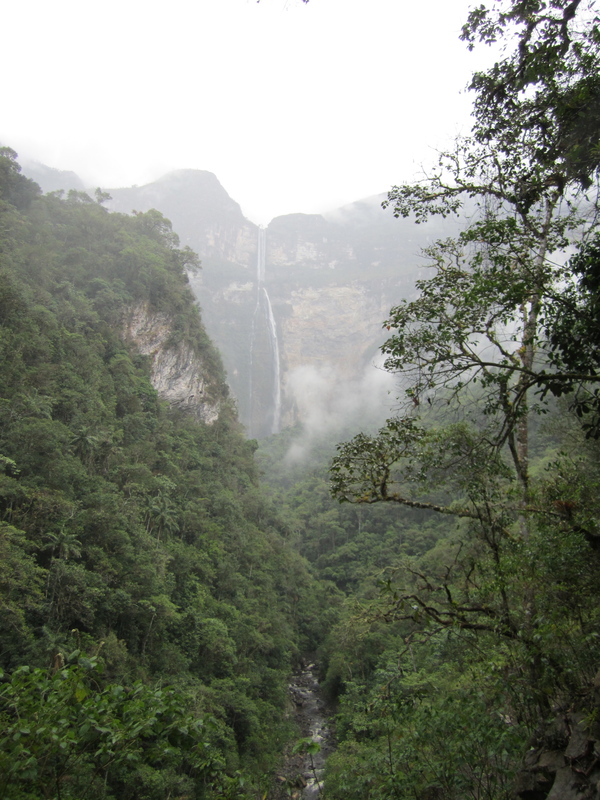 It is either the 3rd, 5th, or 16th tallest waterfall in the world, depending on how you classify and measure it. One measurement puts it at 771 meters (2,530 ft). Lets just say that for us, it was the tallest waterfall we have ever seen, and we will leave the details to someone with a big tape measure. As soon as we got out of the van we were greeted only with views of clouds, right where the waterfall should have been. To say this let a little wind out of our sails was a bit of an understatement, but the guide assured us that this happens every day and the clouds should go away. We proceeded on a two-hour hike though the jungle, up and down mountains, and all the time we were getting rained on. Just as we reached the waterfall, we were finally able to see it all. It was truly magnificent, and it was so large that when you got closer, you could only see the bottom half due to its massive size. Gocta is tucked neatly in the back of a tight valley, and the falls are so tall that by the time the water gets to the bottom, it is simply mist. It was neat to strain your neck back to try to see the top while being blasted by spray. While at the base of the falls, we meet a Red Bull nut who was planning on base jumping the fall in some sort of flying suit. We would have loved to see it, but unfortunately he was planning the daring jump for the next day. We have not found anything on the internet since, so hopefully everything went well. The weather continued to get better as the day went on, and on the return hike we were rewarded with better and better views of the falls. 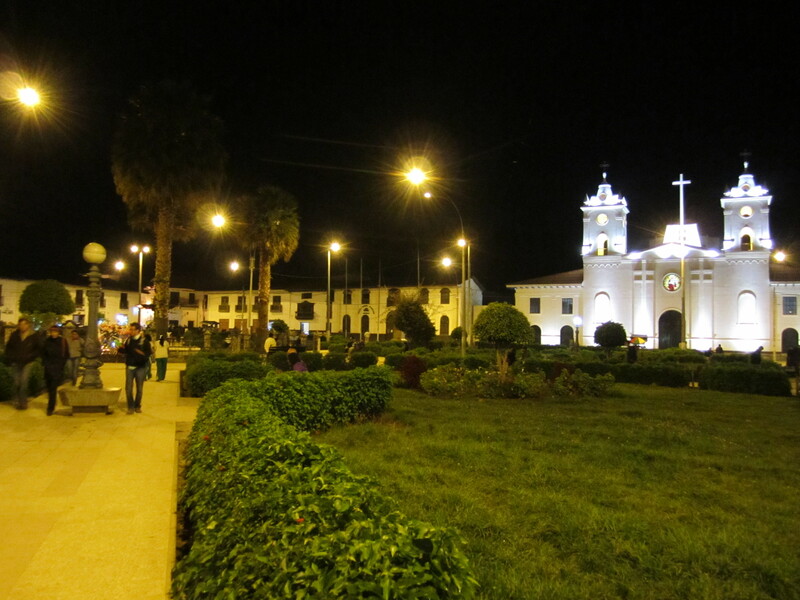 Chachapoyas is a great city to visit and there are so many amazing sights nearby. The town has a great atmosphere, nice people, and the best Oreo shake we have had (order the “Locura Oreo” at Cafe Fusiones). It alone would have made it a trip worth while. 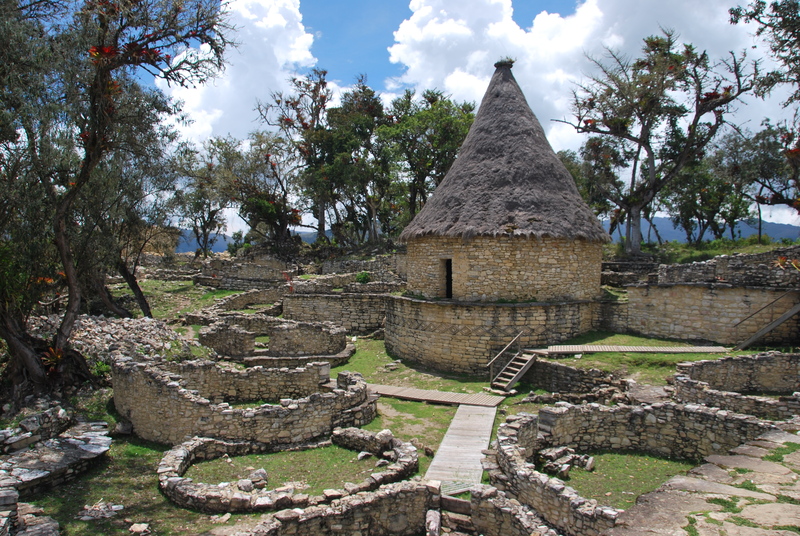 This entry was posted in Peru and tagged chachapoyas, gotca, huancas, kuelap. Bookmark the permalink. 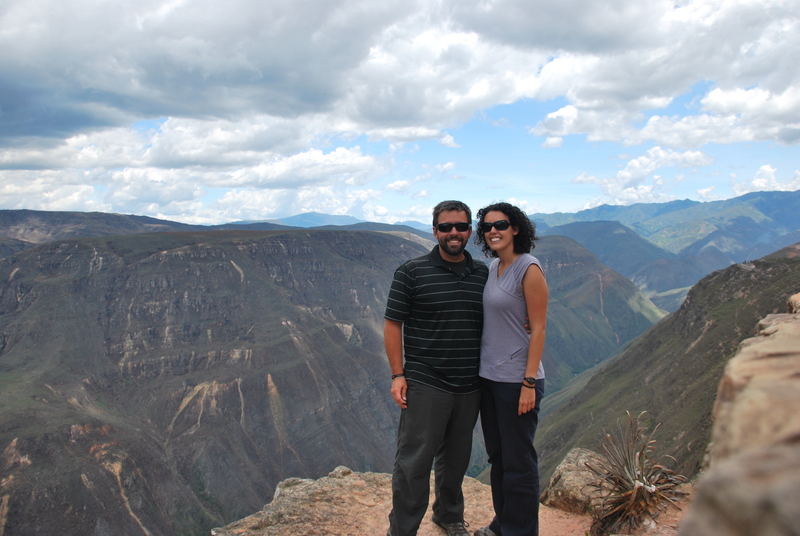 3 Responses to Chachapoyas: As fun to say as it is to visit! Great post! Thank you for sharing and posting all those great photos! We just posted an article today about Kuelap and Peru’s attempt to bring more attention to it to take some pressure off Machu Picchu! I have to say that it would be nice to get more places recognized and on the radar of tourists, but it would also be great to have the experience that you two had of being one of only a handful walking around and having the place to yourself! Tough choices. 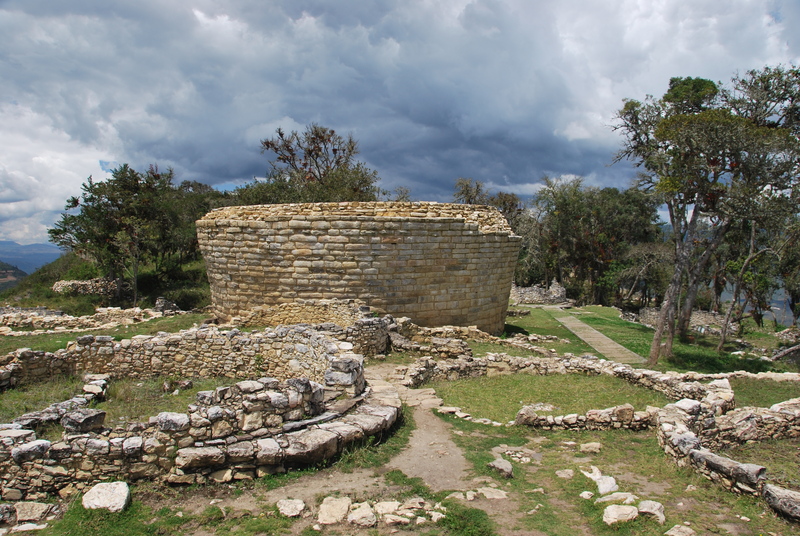 We loved both Kuelap and MP but for totally different reasons. It seems that MP gets all the attention in Peru (and well-deserved), but we continually hear stories about other ruins that sound amazing, but a lot less crowded. 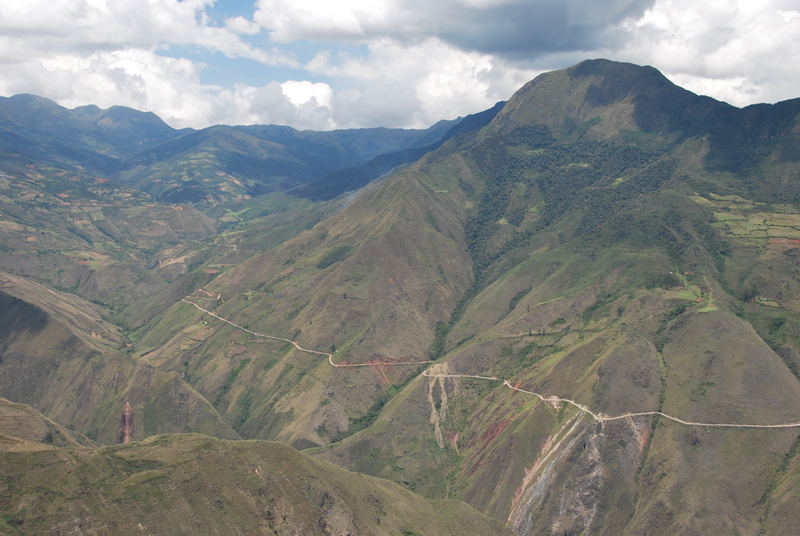 I think the three hour bus ride from Chachapoyas will keep Kuelap much quieter for awhile.